Last May, Mayor Michael J. McGlynn of Medford and his team thought they would honor Krystle Campbell, the Medford native killed by a bomb at the Boston Marathon, with a few park benches and a plaque bearing her name. The garden is planned for a neglected lot alongside the Medford Senior Center on Riverside Avenue. It will include five fountains, a flagpole symbolizing the Marathon starting line in Hopkinton, and milestones to denote landmarks along the race route, said Pamela F. Shadley, the project’s landscape architect. The city has already secured nearly $500,000 for the project, and is lining up $350,000 more, McGlynn said. The centerpiece will be the fountains, one each to represent Campbell and three others killed in connection to the bombings, and one representing the world and all who were injured in the attacks. Boston University graduate student Lingzi Lu, 23, and 8-year-old Martin Richard of Dorchester were killed in the April 15 bombings. MIT police Officer Sean A. Collier, 26, was killed several days after the attacks, allegedly by the accused Marathon bombers. Each fountain will be marked with a bronze memorial plaque that will form compass points, Shadley said. The one for 29-year-old Campbell will point east because she lived east of the garden; Collier’s to the north because he hails from Wilmington; Richard’s to the south toward his home in Dorchester; and Lu’s to the west. The memorial plaques will include images or symbols reflecting each of the victims. a baseball, two bats, and home plate for Richard, who played Little League, for example, and a replica of Collier’s police badge. “We’re trying to do something very special for those four people,” Shadley said. 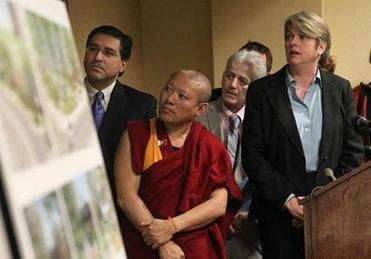 The victims’ families or their representatives gave their blessings to the plans. “Everybody said: ‘Hey, we love it. Go for it,’ ” McGlynn said. Seating areas, walkways, and a flower garden — including Krystle’s favorite, sunflowers — are planned. The design plans have been in the works for 11 months, but McGlynn said the proposal was kept private because the city did not have the money to build the garden. “We said, ‘Should we cut some things?’ Everybody said, ‘No. We’re not cutting anything. We’re going to make sure we build this. We’re going to build this right,’ ” the mayor said. Then a few days ago, the city got word that it had secured a $475,000 federal grant, said McGlynn. A foundation told the city it hopes to announce a $100,000 donation by June 1, and a corporate partner is offering $50,000, McGlynn said. He did not name the foundation or other donor. McGlynn said the city is optimistic it will get a $200,000 state grant, and he said an electrician and landscapers have offered to do work for free or make donations. The mayor gave out his cellphone number in front of television cameras so anyone interested in making a donation could contact him. “We know we can get to the million,” said McGlynn, who told Campbell’s parents about the plans Sunday. Bill and Patty Campbell released a statement Friday thanking the public for its support and detailing charitable efforts established in their daughter’s memory. Seventeen friends of Campbell and her family are running the Boston Marathon this year to honor her and raise awareness about her memorial fund, established at the Boston Foundation. Angell Animal Medical Center, and organizations that help autistic children. A softball tournament honoring Campbell will take place in Medford April 26 and 27 to raise money for her scholarship fund. Last year, the Medford High softball team dedicated its season to her, wearing black armbands in her honor and creating “Medford Strong” T-shirts. Catalina Gaitan contributed to this report. Laura Crimaldi can be reached at laura.crimaldi@globe.com. Follow her on Twitter at@lauracrimaldi.